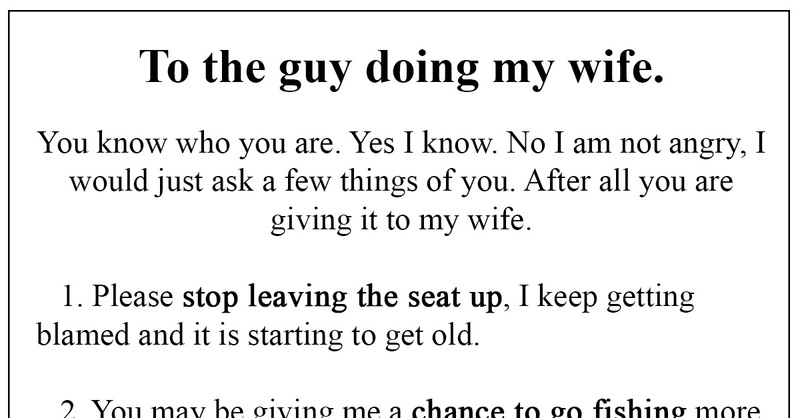 Husband knows wife is cheating, leaves a brilliant letter for the other man! Aside from the joke that the leading cause of divorce in the US is marriage, we all know that adultery is the real leading cause for divorce, and that is the said truth. We will not get into the philosophical debate weather humans are meant to be monogamous or not, or what the real reason behind this is but rather we will just face the facts and deal with it, and facts are that more and more people are cheating on their spouses. Maybe the technology made it so that we are much more available to more people at any given time, and with all the dating and social apps nowadays meeting new people and talking to them has become easier than ever. 5.After doing my wife please use something disposable to wipe off with. The basket of clothes on the right is mine and the clothes are clean as my wife does not do my washing, I run out of time rushing to work. Last week my sweatshirt was crusty(thanks). 8.When she asks “do these pants make me look fat”, say no. You may think giving a different answer will make her think twice about eating a gallon of ice cream a day but all you are doing is giving her a reason to go buy more pants that she will look just as fat in.